In a heavy saute pan, toast the millet on medium-high heat, stirring constantly, until it begins to brown, about 5 minutes. Meanwhile, bring broth to boiling, then carefully pour broth into the millet. Add salt; cover, and reduce heat to low and cook 15 minutes. Meanwhile, heat oil in a medium saucepan over medium high heat. Add onions, garlic, bell pepper, peas, and zucchini; cover and cook for 5-8 minutes. Fluff millet with a fork, and season with salt and pepper to taste. 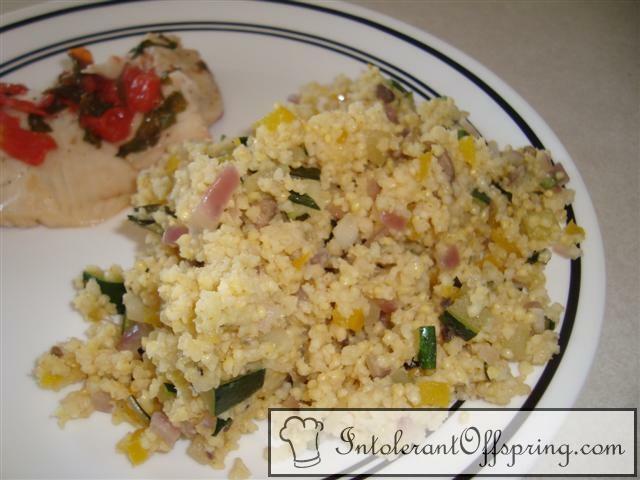 Stir vegetable mixture into millet. Add lemon juice and basil and serve.